Field Research - Get paid to do science! Biome studies - collecting results from a number of experiments in a single biome. Climate studies - performing various climate experiments on bodies with atmospheres. Geological studies - performing geological experiments on various biomes of a celestial body. Experimental studies - run one experiment under multiple conditions (including experiments from mods). KSC Science - contract to go around and collect all the various small science around the KSC. Scientist Ferry - bring a scientist to a specific location to perform a specific experiment. Rare Science - contract with suggested location for difficult biome/situation combinations (eg. Splashed down at Kerbin's Mountains). 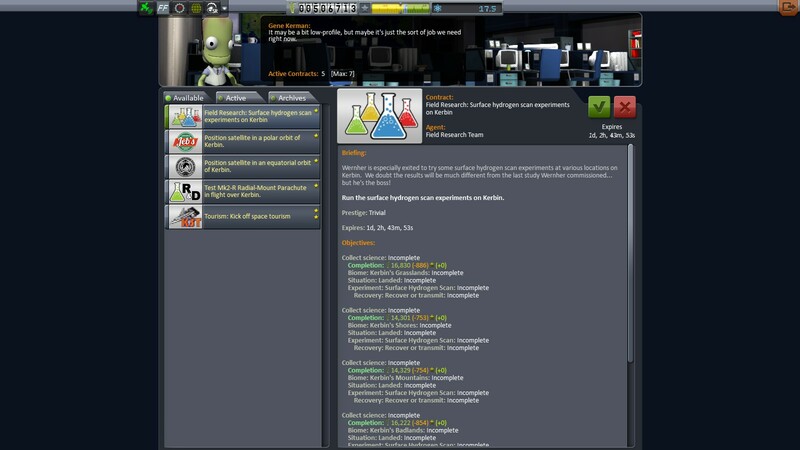 Re-run experiment - contracts for science completionists - re-run an already done experiment to get a little bit more science out of it. The contract pack works for RSS and planet packs - you will receive contracts for any celestial body that is loaded in the game. 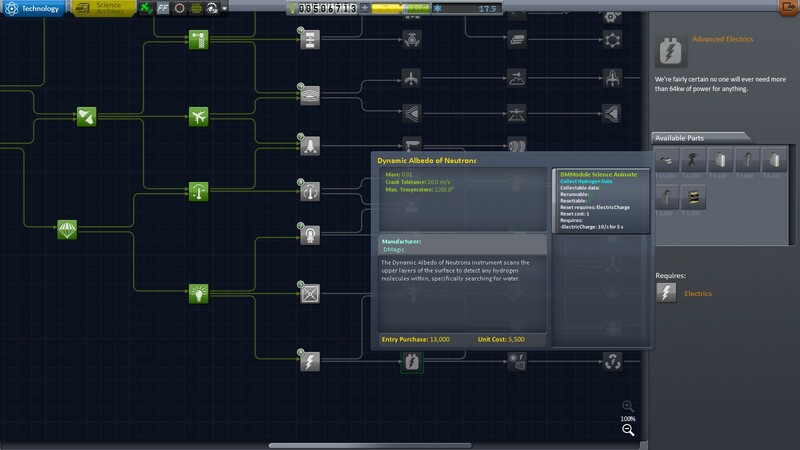 This mod disables the stock "Collect Science" contracts, as they become somewhat redundant when this is installed. CKAN: In CKAN, select and download the mod "Contract Pack: Field Research". Contract Configurator is a required dependency and can be downloaded from the Contract Configurator release thread. M﻿oduleManager is a required dependency and can be downloaded from the ModuleManager release thread. 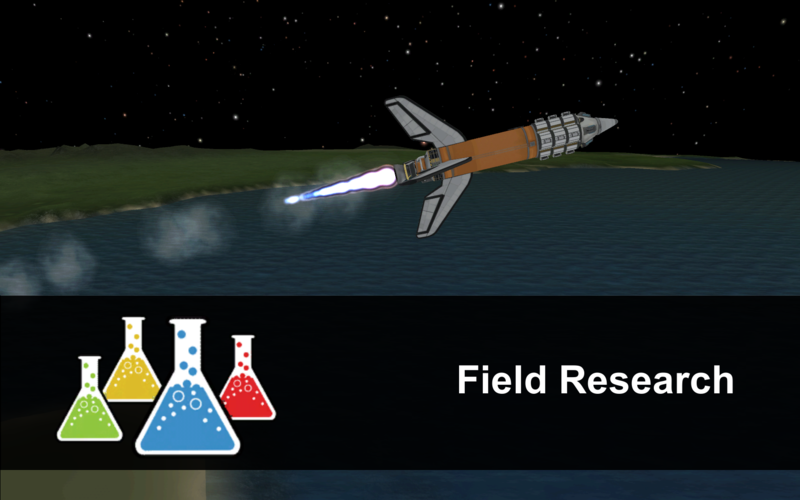 The Field Research Contract Pack can be downloaded from GitHub. Waypoint Ma﻿nager is an optional (but highly recommended) dependency and can be downloaded from the Waypoint Manager release thread. Crowd Sourced Science - You're likely going to be getting a lot of science reports with this mod. Why not make the reports into some more interesting reading with hundreds of unique science reports. Science Alert - Never miss an opportunity to collect science. Also includes a super convenient UI for collecting multiple experiments. [x] Science! - Contains a great GUI for tracking how much science is remaining for various biomes/experiments/etc. No More Science Grinding - Get 100% science from running stock experiments (no more need to re-run experiments multiple times). The full source is available on GitHub. Support for GPP (thanks Aelfhe1m). Fixed DDS settings on agency icon. Fixed uniqueness check on 'scrap science' contract (thanks vardicd). Prevent scientist contract from completing out of order (thanks kcs123). Fix impossible to complete surface samples in Scientist contract (thanks kcs123). Fixed various issues with the scientist contracts (thanks smjjames). Fixed contracts without any parameters (thanks smjjames). Fixed near-duplicate geological and climate contracts (thanks smjjames). SCANsat support - bodies need a biome scan before Field Research contracts are offered (thanks severedsolo). Rewrote some contracts using the ITERATOR functionality to reduce complexity. No longer offer Station Science contracts that are near-impossible to achieve (thanks Mermel). Fixed issue with scientist contract under New Horizons (thanks zeropositivo). Fixed issue with scraps contract (thanks Nori). @arkie87 - For giving me the idea and getting me started on making this. @DMagic - For providing code and general KSP science systems support. @xEvilReeperx - For providing a great block of code to get the list of science subjects out of KSP. @amorymeltzer - More general science support! @ObsessedWithKSP - For all the things you do. Everyone else who posted in this thread where the idea got started. @Zeenobit - For his very cool mod Historian, ﻿(now maintained by @Aelfhe1m) which I used to put together the images for this post. Like what you see? Consider donating to the beer fund! It will not go directly to supporting this or other mods under my care, but it may keep my motivation up! This fills a big hole in the science contracts. When Squad introduced "go do thing in area" it was a start, but it wasn't directed or helpful. This pack is both of those, and looks really well done. Three cheers for completionists! I really want to thank Nightingale for this - it's a good example of the creativity and effort that makes this community great. The request was made less than a month ago, and now there is a beautiful mod doing exactly that. What more could you hope for? Why do you have to keep making contract packs that I just have to have? Downloaded. Contract for Hydrogen scan. Also, the new contracts don't seem to work with the admin building contract modifiers. I have the funds for rep plan enabled, and it takes away funds from the contracts, but returns no rep? Maybe small bug there? For the time being I'm going to have to hold off on using this one. Its a great mod, just seems to have a few small issues that need addressing. Sorry. Also possibility I'm not understanding something in here, so If I'm in the wrong, I'd appreciate an explanation of what I've misunderstood. Thanks. Wow, thanks for this! It was released sooner than I expected. In "Experiment.cfg" it reads "Wernher is especially exited" when it should be spelled "excited." Waypoint Manager isn't included in the list of optional dependencies to accompany this contract pack. Definitely should be in that list. Again, you rock. Thank you. I'm making a list, and checking it twice..... I think its safe to say your probably on the nice list. Hmm Suggestion, I have not looked at the contents, but from seeing your other mods, you might want to switch from .pngs to .dds images. Sweet! Way to go nightingale! Don't forget to add this contract pack on Contract Configurator's first page! It's a known issue, raised [#222] to track it. It actually does check the tech tree, but DMagic uses a custom module for his science experiments. I just need to add in some logic to detect it - hopefully should be a fairly easy change for the next version of Contract Configurator. Oh and these shouldn't have any cancellation fines. Thanks, fixed both of those! Yup, it's already all .dds for the images that can be .dds (waypoint icons and the scaled down agent image need to be PNG or KSP croaks). I checked the log because I got some stutter ingame. Do you have an insight on what could cause this? Provide a full log file and I'll look into it - I was playing around with that stuff right before release. Either I forgot to commit something, had some unreleased changes in Contract Configurator that I forgot about or you managed to find a situation that I wasn't aware of. EDIT: Actually that wasn't what I was playing with, so will definitely need to see that log. I have a suspicion that I know where the problem is - was this a new game, and was it your first launch? Hi, exactly, fresh save, first launch in career mode. Log is already overwritten I fear. IÃ‚Â´ll see if I can reproduce it now. Awesome, thanks. I think I see what the issue is, raised [#224]. Should be a fix tonight, although I don't believe this should cause any issues in your game - you can just ignore the exception. Hello there! First off, awesome! Second off. There's some weird interaction between this contract pack and Station science. I've seen a lot of "science at KSP" missions pop up... requesting things like Zoology bay, prograde quarks experiments... which don't work in kerbin! Also, shouldn't those contracts ask you to do research with modules you have unlocked? Is there an easy way to disable the KSC Science contracts? I've always felt that the KSC science points are too cheap. I always limit myself to the runway and launchpad. I can just decline those contracts, but I'd rather if they didn't show up. Thanks! I assume that they aren't valid landed places other than KSC either, right? If that is the case it almost seems like this might be an issue with station science, as I check whether the situation (landed/flying/in space/etc.) and experiment combination is valid according to the KSP API. Regardless, I'll need to do some digging, as with Orbital Science. Not at the moment, although I'm looking at adding a way to disable/enable contract packs per save, and may fold in the ability to do it at the contract level as well. Also for that particular contract, it'll stop being offered once you go interplanetary. Perhaps I need to rethink the KSC science contracts. KSC science is a silly grindy mess if you try to get it all (it was okay before the upgradable buildings came into play, but the fact that you can get reports for "R&D East Lab" and junk like that is a bit silly). I'm sort of okay with it asking for the stuff that's late in the tree as long as the unlocking bugs are fixed with the mods that are adding experiments in their own way. But you're right... if the player has spent 3000 to unlock their super-late game experiment, they probably don't want to drag it around KSC for 10 science a pop at a bunch of random buildings. Another thing I realized is broken is that some of the biomes don't actually exist until you upgrade the particular facilties (R&D especially). So, opinions, people? Should I just toss them entirely? Or are there some easy changes I can make to improve them? I'll be honest, I can't think of any easy, interesting way to spice the KSC contracts up. It's nice that they give an early direction about things to do... but newbies don't really look for mods, do they? There's actually even one at the VAB that goes away once you get to level 3. Can CC detect building levels? Your mods are the only things that make career mode worthwhile for me. Great work. I'm sort of okay with it asking for the stuff that's late in the tree as long as the unlocking bugs are fixed with the mods that are adding experiments in their own way. But you're right... if the player has spent 3000 to unlock their super-late game experiment, they probably don't want to drag it around KSC for 10 science a pop at a bunch of random buildings. How about asking for experiments to be done after or with Anomaly Surveyor contracts? I am only assuming this is easy fix since you did those contracts. Additional field science trips make you add ground stations around an Anomaly. Or add research in other interesting areas. Which must be revisited as more experiments get unlocked. I agree, it would be good to check if an experiment is unlocked and "owned" in the tech tree by just looking at the node. Easy said that done with way some experiment mods seem to work. I also think that station science needs looked at. These experiments seem to be checking location twice. They can only be started in orbit and finished when recovered. More importantly they require resources that can only be provided by larger station parts. I really like that as you need to plan out space station logistics. It would be great if you looked into this more if it deviates from the KSP API. it might provide a way to chain contracts together in a flexible way. However I hope it does not break your current contract systems. Another excellent contract pack from nightingale. I am very happy to see this, and out so quickly, too! Ugh, the one that goes away is awful. I can detect the building levels, but I'm not sure if I actually want to... it's just getting a bit too much for what was meant to be a rather simple contract out of the bunch. Yeah, that's what I get for making last minute changes Sunday night before releasing. I accidentally broke this one, it's not looking at the bodies that have been orbited anymore for it's selection list. Anyway, fixed it for the next release. I'm sure I can work it in. It'll be second on the list to look at after orbital science. Yeah, but I get worried about making requirements too onerous that nobody ever sees the contract. I suspect most people who have Anomaly Surveyor haven't done the Jool contract, and that thing took me ages to get right.